As a global company with manufacturing plants, sales and service companies worldwide, IMA Group develops, manufactures and sells both individual machines as well as complete packaging lines for the dairy and food industries. ERMETIKA. How do you fill? Fill Good! Ermetika fills pouch right through the spout, using full pouch capacity to grand 100% filling and no leakage. 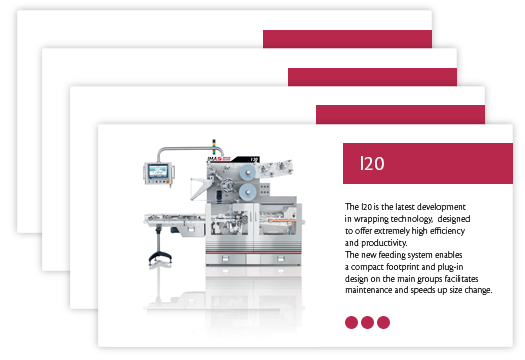 Reaching a production capacity of up to 2000 tablets/min, the new I20 is the latest development in wrapping technology, designed to offer extremely high efficiency and productivity. IMA offers solutions to the packaging challenges of the food & dairy industry with state-of-the-art thermoform, fill and seal machines (FFS) for cups, portion packs and stick packs, fill and seal machines (FS) for preformed cups and tubs, vertical form, fill and seal machines (VFFS) for bags, filling machines for spouted and unspouted pouches, wrapping machines e.g. for cheese, butter, margarine, yeast and soup cubes, cartoning and end of line solutions.